A double calendar spread is an options trading strategy that takes advantage of the one certainty associated with all options contracts - they all expire at some point. Consequently, it is a favorite advanced strategy used by market professionals. Why? Because it entails minimal risk and can be managed in such a way that even potentially losing positions can be turned into profitable ones. If you know what a calendar spread is, then you'll understand that the double calendar is simply an extension of this principle. It relies on the underlying stock or ETF to remain within a trading price range up to the expiration date of the sold options. This is how you profit. 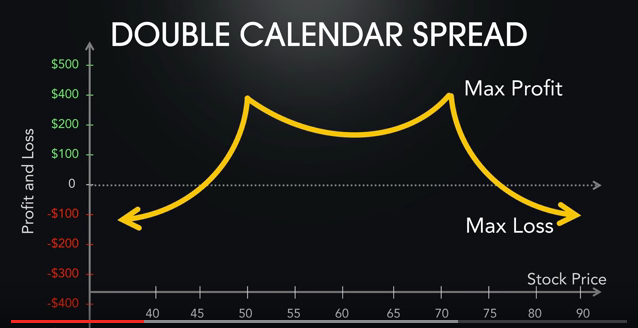 Unlike a calendar spread, the double calendar spread extends, or widens the range within which a profit can be realized. Not only so, but whereas a simple calendar spread uses only call or put options, the double calendar uses both - and does so at the upper and lower ends of the trading range that you choose. Looking at it another way, you could say that the double calendar spread is like a short straddle or strangle strategy, but with additional positions added. These additional positions are long options and with a later month expiration date, on either side. Since the later month long positions will cost more than the earlier month short positions, the spread will incur a net debit to your account. This debit will also be the maximum risk for this strategy. Let's say we are entering our position in May of any given year. We sell an equal number of June call and put options at strike prices, say $20 apart (let's assume $50 puts and $70 calls). There's our short "strangle" done. To this setup we now add the purchase (going long) of the same number of calls and puts, but with July expiration dates and the same strike prices. So in the case of our example here, we would buy July $50 puts and also July $70 calls. Most reputable brokers will allow you to enter all 4 positions as one trade, rather than legging into them. But if you must leg into the trade, do one calendar spread first and then the next one. Looking at the risk graph below, you'll see that it looks like a "tent". If the earlier month short options expire within the prices displayed in the tent, you take a profit. Continuing our example, should the underlying price action of the underlying subsequently explode beyond the $50 or $70 levels, one of your June expiration short sold options will increase in value while the other will be way out of the money and therefore, decline. At this point you could choose to buy back your losing 'sold' option for next to nothing and continue holding the losing July long position, allowing for the possibility of a reversal. Your other 'sold' option (the one whose strike price has been breached) would ordinarily expose you to unlimited risk but this will be protected by your longer dated bought option, since they have the same strike price. The same principle can be applied to convert straddles into a double calendar spread, if the anticipated price explosion needed for straddles to profit, doesn't take place. Only in this case the strike prices are all the same. Before you consider placing a double calendar spread, there are a couple of things you need to see in both the underlying and the options themselves. 1. You should believe that the underlying will remain within a trading range for the duration of your short options' lifespan - so taking our example above, until June expiration date. But here's the real important one. 2. You should also look at the options implied volatility for both the near month and later month options. The best trades are made when you see a "volatility skew". These occur when the near month options have a higher implied volatility than the later month options. Since you want to sell the near month options, you would like to receive as much as possible and this is why you look for these skews. If the longer dated options have a higher implied volatility than the shorter dates ones, stay out of the trade. If the volatility skew is too good, it could be telling you that an upcoming company earnings report is approaching. Since these can produce unpredictable results for stock prices, you should first check that an earnings report is NOT on the horizon before placing the double calendar spread trade. This is one reason why ETF options might be preferable than company stock options. If the volatility skew is a natural one and shows at least a 2 percent difference, you have a good candidate for entry. 3. Your short positions should be no more than 30 days until expiration because during the final 30 days, out of the money options decline in value more rapidly. Your long positions can be one or two months later. Before executing your double calendar spread, the final thing you need to look at is a risk profile graph. Ideally, it should look like a "tent" as in the example above, with two peaks and a slight dip in the middle. The risk graph will show a range of stock prices at which the position will make a profit. Ideally, the current market price of the underlying at time of entry should be in the centre of the risk graph. This will allow you enough movement to the upside or downside before your breakeven points are breached and any adjustments may be necessary. The beauty of this strategy is that because you are on the selling end of options contracts, you have 'theta' or 'time decay' working in your favor. Maximum profits are achieved when your near month options both expire worthless because 'at-the-money' while your long dated options still have enough time value to close the whole position for a profit. Finally, you should NEVER simply put this type of trade on and then just hope that the underlying will remain within the desired range until your short options expire. THE SECRET to making CONSISTENT PROFITS with double calendar spreads, is to learn the art of adjustments. 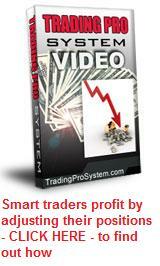 How and when to make these adjustments is explained in depth, in the very popular Trading Pro System video series. Knowing how to interpret "the numbers" so that you can adjust your positions, is the key to a consistent monthly income stream that will never fail.